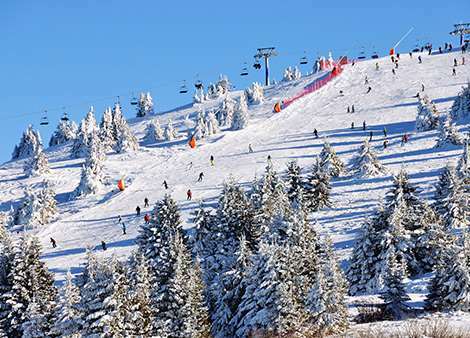 Serbia is one of Europe’s most interesting ski destinations and offers a tranquil environment, glorious winter weather and exceptional hospitality. If it is quality ski in-ski out accommodation and good value for money, then skiing in Serbia is definitely worthy of your consideration. The country is perfect for first-time skiers and families looking to get into the sport, with a number of beginner and intermediate runs designed for those who are unfamiliar with the slopes. Kapaonik is the leading resort in Serbia and boasts 55km of runs for alpine skiing and 12km of cross-country runs, along with a lighted run for those interested in getting on the slopes later in the evening. The resort offers fantastic English spoken ski instruction and all of the resort's amenities and accommodations are a very close proximity to the slopes. For youngsters, there is even a “ski kindergarten” area featuring a conveyor belt and a carousel that makes it easier to develop basic skills. There is also a snowboard park that hosts a selection of domestic and international contests. With so much variety on offer, Kapaonik is an excellent option for those looking for the golden combination of great conditions, excellent value and outstanding hospitality. Kapaonik benefits from fantastic winter weather during the ski season and an artificial snowing system covers 97 per cent of the resort. It is available for skiing between December and April. The winter sports area is located between 1,056 metres and 2,017 metres, offering some truly breathtaking views of the Serbian scenery. Once you’ve finished your day on the ski slopes, there is much to enjoy away from the runs. There are two nightclubs and a selection of great restaurants, including the Dolly Bell and Exit eateries, which both offer traditional Serbian cuisine and a wonderful, relaxing atmosphere. If you are looking to taste some more familiar food, Nasa Cuca is an excellent Italian restaurant where visitors can look forward to delicious pizza, pasta and a range of other delicacies. Kapaonik has a variety of hotels, apartments and chalets to choose from, many of which are located close to the ski lifts and offer easy accessibility for skiers to get on the slopes as soon as they wish. The closest airport to Kapaonik is Nis Constantine the Great Airport, which is just over two hours away. There is a selection of lift passes available for skiers to choose from, including options for individuals and packages for families, while a six-day ski pass will offer the best value for many holidaymakers.